Bobby James aka DRUMNDIRTY has an arsenal of music ready to rock any room. Having toured the globe as a performer for over 25 years, the pulse of music roars deep and sates the demand of growing audiences worldwide. Producer, drummer, DJ, show curator, video editor and songwriter, DRUMNDIRTY lives to create, which is apparent any time you see him on stage. As a DJ, his broad spectrum of taste and styles have granted him access to all sorts of audiences, from the most elite corporate crowds of Montreal Grand Prix, Samsung, REMAX and Junofest, to the most raucous festival/club shows at Aura, Cocoon Club (Germany), Toronto/Vancouver Pride, to long lasting lounge residencies at Vancouver Opus Hotel (2004-2010), and multiple Milestones Lounges (2015-2017). ​ He is a wizard at reading the mood of any room and always follows suit until everyone is up and shakin' - No matter what DRUMNDIRTY is playing, heightening the experience is the addition of live drums - from laid back percussion on the djembe hand drum, to the explosive force of his triggered light and lasered drum kit - Scaled to fit all occasions be it big or small, you know every time you ask - you will get a show. Unique energy, combined with passion for his craft allows for awe inspiring execution every time. ​ One of the most trusted and valued performers on the Canadian Westcoast, DRUMNDIRTY is constantly recording, performing and DJing. 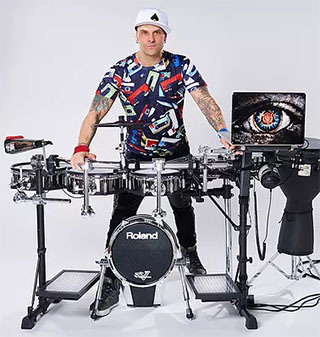 As a Roland VDrums Ambassador, he also tours as a speaker who inspires other musicians through clinics, concerts and speeches. Noteable Entertainment & Events is a Vancouver based booking agency, party rental, entertainment services and event production company. If you are interested in booking DRUMNDIRTY please contact us.